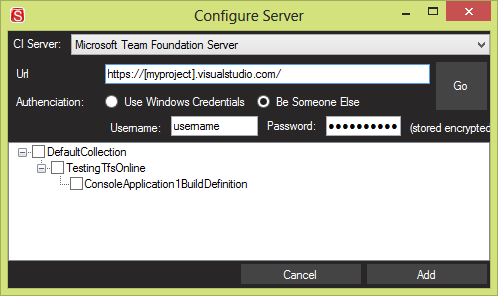 We now support Team Foundation Server 2013 including the new Git based projects. You may also be happy to learn we fixed some issues we had with watching builds from multiple project collections. 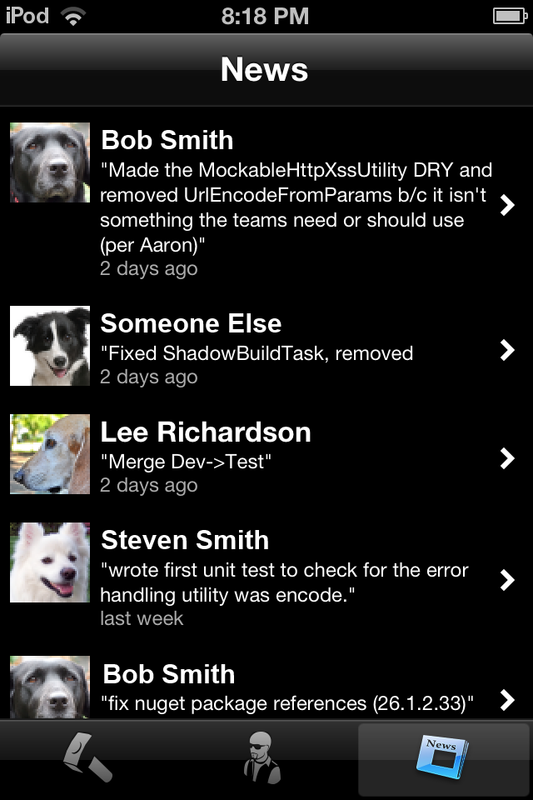 You can also search and add new builds more easily for those with large TFS repo's. 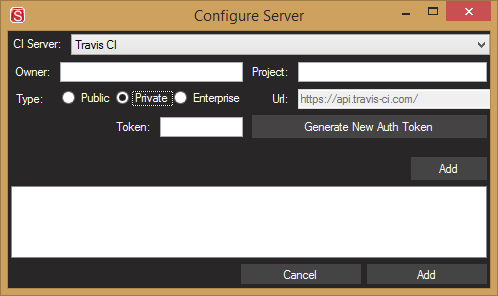 We now support Travis Pro and Travis Enterprise. If you have a large Jenkins repository you can now filter and select all nodes more easily. CruiseControl.Net now returns comments and build names. Big thanks to Benoit Martin (benoit808) and Jonathan Ritchie for these contributions. That's it for now. This update sets the stage for a big announcement we'll have shortly. In the meantime thanks for all your support! 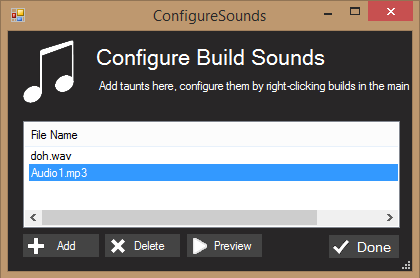 We just released version 2.3.4 which adds support for Travis Pro and Travis Enterprise. 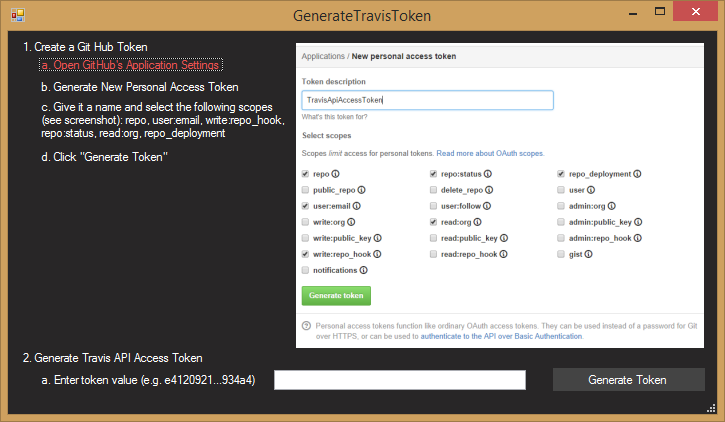 Click "Generate New Auth Token"
Click "Generate Token" and we will initiate a request to Travis (using the URL you specified on the previous screen) to create a travis API access token. We hope you enjoy the new features. Shoot us a note at support at our domain name if you need help or drop a bug on github if you find any issues. If you have a spare Raspberry Pi sitting around (and who doesn't) or are seeking an excuse to buy that newly released Model B+ model with 4 USB ports, then have you considered combining it with a Siren of Shame to hassle your build breaking office mates whether you're at the office or not? If that sounds good this article is for you. You'll need a Siren of Shame device and a Raspberry Pi that's running and connected to the Internet. Element14 has a great getting started set of videos if you're completely new to Raspberry Pi. This post used the Raspbian OS, but theoretically it shouldn't matter what OS you use. Libusb provides an API for applications to interface with USB devices, including Human Interface Devices (HID) such as the Siren of Shame. To install libusb use apt-get (the universal Linux installer). If your device doesn't show up, it could be an issue with the cable. Andy Lowry, who has an excellent blog post where he lights up his siren of shame when freight trains are near, reports that he had to try several cables before finding one that worked. Incidentally, rather than using node-sos-device directly, we will be using the higher-level node-sos-client, which knows how to monitor Jenkins and Bamboo CI servers. For some fortunate users (Andy Lowry for one) installing node via apt-get works fine. If, however, you get an error about node being out of date you'll have to uninstall, download, and update your path. If you restart your command prompt and type node --version you should get v0.10.2. In this case try experimenting with the way you connect the device to the Pi. And you're done. 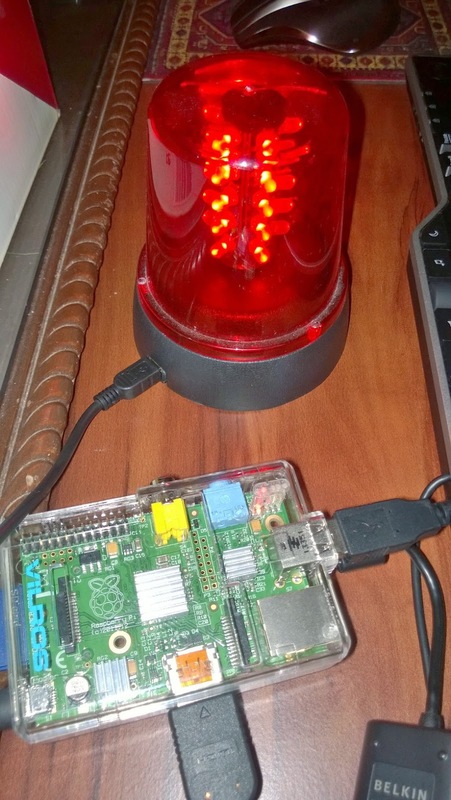 With any luck running sudo node build/sos-client.js will light the siren and sound the speaker on initial connection, and whenever the build breaks. And now you too can terrorize your build breaking colleagues, even when you're not at the office. Enjoy! With per-user rules and our fancy rule engine you can now taunt co-workers by name when they break the build. How cool is that? If you're into TFS (by choice or divine mandate) and using the Microsoft-hosted cloud version (previously called Team Foundation Services) we now have your back. See Configuring Visual Studio Online for details. 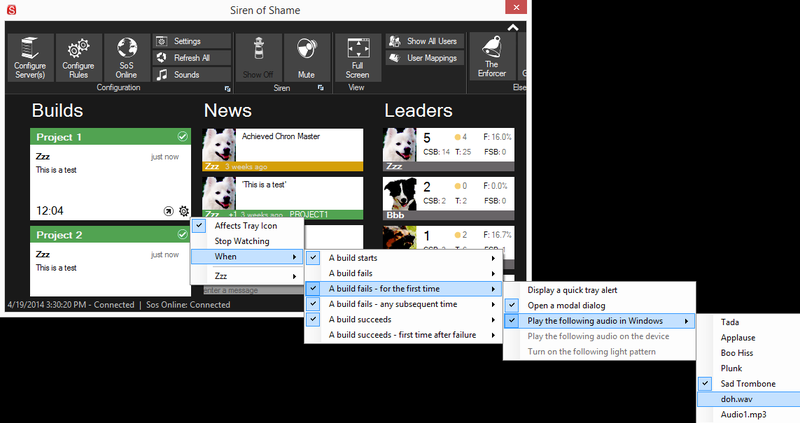 As of Siren of Shame 2.2.0 we now support Visual Studio Online (previously Team Foundation Services). 3. 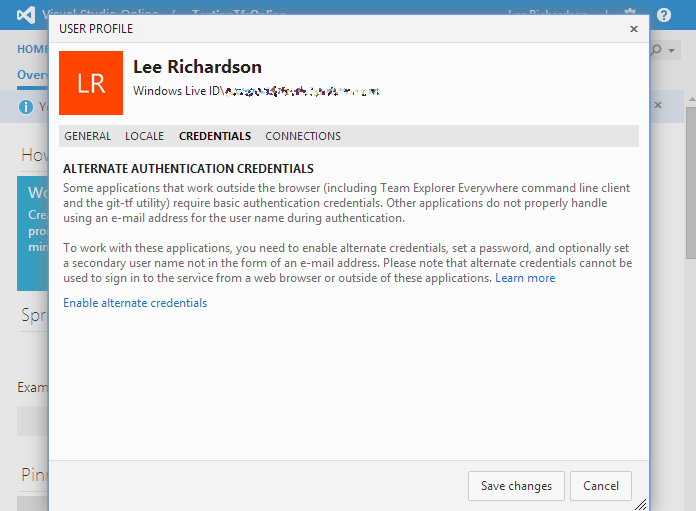 Click Credentials and select "Enable alternate credentials"
We recently talked with a Siren of Shame user who proudly announced that Siren of Shame was the second app they installed on their new smartphone. Naturally we asked: "So what did you think?" to which they sheepishly responded "Um, it installed". The problem was that the Siren of Shame app (Android in this case, but all the apps work the same way) showed global leader boards and global news. The user could see the state of their builds, and the push notifications were nice, but they wanted localized gamification data. They wanted to know their reputation within their team and to see news relevant to their project rather than competing with a bunch of people they didn't know. Today we are proud to announce two new features for My CI customers that help make data more localized and relevant. Better? We think so, but feel free to respond in the comments. The Leaders page looks similar in that only those individuals listed above will be shown. We hope you enjoy the new localized data. Please post in the comments if you feel we're headed in the right direction (or not) because there is more great stuff to come along these lines in 2014 (hint: it's called Team CI and it's nearly ready).